1. Make sure the bookmarks toolbar is visible in your browser. You can enable it if you go to the "View" menu in your browser, click on "Toolbars" and check: "Links" in Internet Explorer, "Bookmarks Toolbar" in Firefox and "Personal Bar" in Opera. In Google Chrome, you can enable the bookmarks toolbar by typing Ctrl+B. 2. In Google Chrome and Firefox, drag the bookmarklet below to the bookmarks toolbar. In IE, right-click on the bookmarklet, click on "Add to Favorites" and select "Favorites Bar" or "Links" from the list of folders. In Opera, right-click on the bookmarklet, click on "Bookmark Link", then click on "Details" and check "Show on Personal Bar". fantastic - thanks for the tuts. 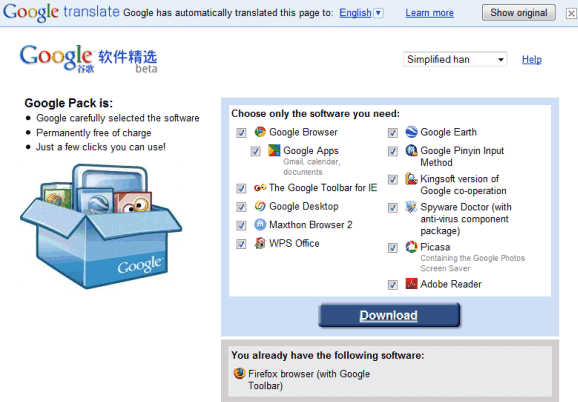 I don't use google toolbar, but do use the translation service very often. I like it. It's a lot simpler than the code I was using - I had to specifically code for each language. This way, I don't need to do anything when Google adds a new language. Strange, when I click the Translate button on the bar (NOT the bookmarklet button), I'm getting "Error: The server could not complete your request. Try again later." And it seemingly affects just non-English pages; translating English pages to another language works fine. I liked it so much that I made a simple Chrome Extension . this is sweet, another great tip. thanks! Anyway to set default "translate to" language? Thanks for the information you have been shared to us. I'm glad to know that those online tools can really help my optimizing process as Search Engine Optimizer (SEO). Have I said how much I love Google. They keep making awesome products and give it away for free. Oh, and my Android phone is awesome. This can come in very handy! Thanks for the info. it is favorite bookmarklets translates the current web page into English using Google Translate: you can find it here.thanks for this site.cheap cosmetics. Well that's great, it is really an important tool needed for one's business. Thanks, I did not know we could do that with Chrome, so I always used firefox + google toolbar until now. However, I prefer using Chrome since it is much faster than firefox and does not consume as much of memory. "Error: The server could not complete your request. Try again later." happens if you're using Firefox with the Flashblock add-on. Do you Google Toolbar or Google Chrome? Both products have options to disable the bar for some languages and even to disable it completely. All in all not very userfriendly in my opinion !!! I am not sure that I understand your issue. You're saying that you see Google 's translation bar at the top of any page written in a foreign language, but you're not using Google Toolbar. Are you this is not a problem limited to a few sites? Google provides a translation bar that can be added to any site. You are right about the translation bar being added to a specific site. I was not aware of and did not consider that option... Thanks for pointing it out. it's not working now. Please update this bookmarklet. Hi. This bookmarklet works great for real-time translation. However, I would like the ability to choose my source language since the auto-detect doesn't always work. Is it possible to do that? Google sites do not allow html in their sites as i tried several times and it refuse me to accepted it because i want to choose which language for my website. It works with no google sites but not google sites why? "Google Translation Bar" is my most favorite toolbar provide excellent translation service and it's very helpful for me.